The Town of Frankfort is a small Waldo County town located on Route 1A on the west side of the Penobscot River in the shadows of Mount Waldo, halfway between Bangor and Belfast. 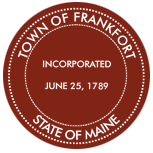 The Town of Frankfort was incorporated June 25th, 1789. The 2010 census listed the population of Frankfort as 1,127.